"Surprising Depth with Some Mixed Messages"
In THE LEGO MOVIE 2: THE SECOND PART, the LEGO world of Bricksburg is invaded by aliens that capture their best leaders. It’s up to Emmet to save them. 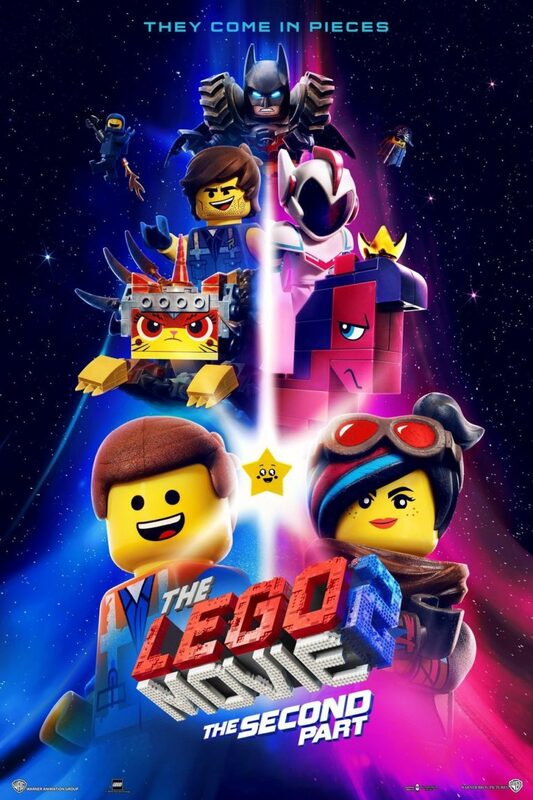 THE LEGO MOVIE 2: THE SECOND PART has many funny moments and excellent writing, but the messages are mixed with some positive moral messages and some politically correct undertones and light innuendoes. So, MOVIEGUIDE® advises light caution for children. THE LEGO MOVIE 2: THE SECOND PART is a sequel to the animated hit movie THE LEGO MOVIE, about the LEGO Construction Toys that live in the basement of a human family. At the end of the first movie, the human boy, Finn, finally is allowed to play with his father’s massive LEGO collection. In the LEGO animated world, Emmet (Chris Pratt) has become the unsuspecting hero of Bricksburg with his kind heart and creative master-building skills. However, the world they’ve created is threatened when Finn’s little sister, Bianca, is given permission to play with the LEGO toys as well. This introduces the citizens of Bricksburg to a new type of toy, the Duplo, which comes in like an alien and wrecks havoc on their civilization. Five years later, in order to survive the “girly” Duplo invaders, the town becomes a gritty, post-apocalyptic world. Everyone in the world has to toughen up now, which is easy for someone like Lucy/Wyldstyle, Emmet’s best friend who’s a strong warrior and an overall pessimist. Emmet, however, is always happy and cheerful, something he makes known through his song “Everything is Awesome,” which he sings all the time. One day an alien invader called General Sweet Mayhem arrives and captures Emmet’s friends, including Batman, Lucy and others, and takes them to the Systar Sytem in space. It begins to occur to Emmet that maybe his friends were taken because he isn’t hard enough. So, he builds himself a spaceship and sets off after General Mayhem to save his friends. When General Mayhem arrives in the Systar System, Batman, Lucy and the others are introduced to Queen Watevra Wa-Nabi, a giant Duplo who reveals she’s chosen their fiercest leader, Batman, as her future husband, and the rest of the group gets to participate in the wedding. Obviously, everyone is horrified at this, Batman especially who more than anything in the world, doesn’t want to get married (because of his commitment issues). However, Queen Wa-Nabi entices everyone by bribing them with things they like, and brainwashing them with happy pop songs that get stuck inside their heads and puts them into a trance. Emmet goes after his friends to save them. Along the way, when he finds himself about to crash, he’s saved by a mysterious character, Rex Dangervest, a galaxy-defending archaeologist, cowboy and raptor trainer (an inside joke about actor Chris Pratt’s role in the Jurassic World movies). Rex agrees to help Emmet go to the Systar System to save his friends, but he’s warned by Rex that it’s very dangerous. Will Emmet be able to toughen up and save his friends from the Duplos who are far too happy and joyful? For all the goofiness in THE LEGO MOVIE 2: THE SECOND PART, the filmmakers surprisingly give it twists and turns that keep the movie fresh and engaging. As many know, the twist at the end of the first movie was the revealing of the human characters that controlled the LEGOs. In the sequel, it’s no longer a twist, and sometimes viewers are given more insight into who the human characters are. The writing is quippy, with many fun jokes, and hilarious pop culture references. The movie’s messaging adjusts somewhat with the twist at the end (SPOILERS AHEAD). At the beginning, there’s an emphasis on Emmet discovering that he’s too soft and that he needs to toughen up to fit in the world where he now lives. At one point, the “alien” asks why Emmet, the “hapless male,” is considered the leader of the group when Lucy is the one who actually fights, to which she has no reply. Halfway into the movie, there’s a politically correct tinge to the story that smells like social commentary on “toxic masculinity,” because Emmet is on a journey to become the tough man the Lucy needs him to be. However, a key twist reveals that the toughness and grittiness that Lucy, Batman and the others feel, but Emmet doesn’t, are simply metaphors for Finn’s hardened heart toward his sister as he’s grown older. Emmet represents the younger version of Finn, who enjoyed the simple things of life, like building, and didn’t need to be gritty and dark. The Duplos, including the evil aliens who kidnapped Lucy and Batman, represent Bianca’s desire to simply play with her older brother who doesn’t give her the time of day anymore. In the end, Emmet gives a moving speech, stating it’s easy to harden your heart, “but the toughest thing to do is to open your heart.” In the context of a little boy learning to love his sister, and play with her, the message is actually very sweet. That said, in the end, while Emmet is willing to stand up against the villain who’s hardened his heart and wants to endanger everyone, Emmet isn’t able to defeat him. It takes Lucy with her fighting skills to swoop in and save him. While the filmmakers are clearly attempting to make a statement by having the woman save the man, it actually seems to undercut the movie’s main message of individuals overcoming their own hardened hearts (END OF SPOILERS). The worldview in the context of the twist at the end is moral and positive, but it’s hard not to notice commentary on gender stereotypes that, when explored more deeply, could have unbiblical implications. Being strong and kind are not mutually exclusive. Lucy positively becomes less hardened and grows into a better, more compassionate person in the end. Emmet, however, doesn’t change much. As he becomes more tough and courageous, he actually causes more problems, and, in the end, the movie just affirms the way he was before. This is not only a bad message, but it makes the movie less fun and impactful. The questions presented in THE LEGO MOVIE 2 are oddly deep and nuanced for a children’s movie. The level of writing definitely makes it enjoyable for adults. However, despite the movie’s positive themes, there are some innuendos and light mature jokes that require caution for children. Lying, kidnapping and characters get tattoos. THE LEGO MOVIE 2: THE SECOND PART is a sequel to the animated hit THE LEGO MOVIE, about the LEGO Construction Toys living in the basement of a human family. In the LEGO world, Emmet and his best friend, Lucy, are separated when an alien arrives in their LEGO city and captures Lucy and several others. Emmet, who’s a bit on the soft side, must toughen up to rescue and save Lucy from the aliens that want to do her harm. For all the goofiness in THE LEGO MOVIE 2: THE SECOND PART, the filmmakers give it twists and turns that keep the movie fresh and engaging. However, the movie’s messages are mixed. In the beginning, it seems like there’s some politically correct commentary on gender stereotypes that contradict biblical theology. In the end, a twist reveals that the predominant message is actually about siblings getting along, and a brother learning not to harden his heart toward his little sister. This theme is positive and sweet, but it doesn’t completely wipe free the politically correct elements. MOVIEGUIDE® advises a light caution for children.